Bristol’s Georgian House Museum is a surprising and sobering glimpse of an 18th century slave owner’s home. If you’ve toured in the UK or anywhere in Western Europe, chances are, you’ve walked around more than one historic house. 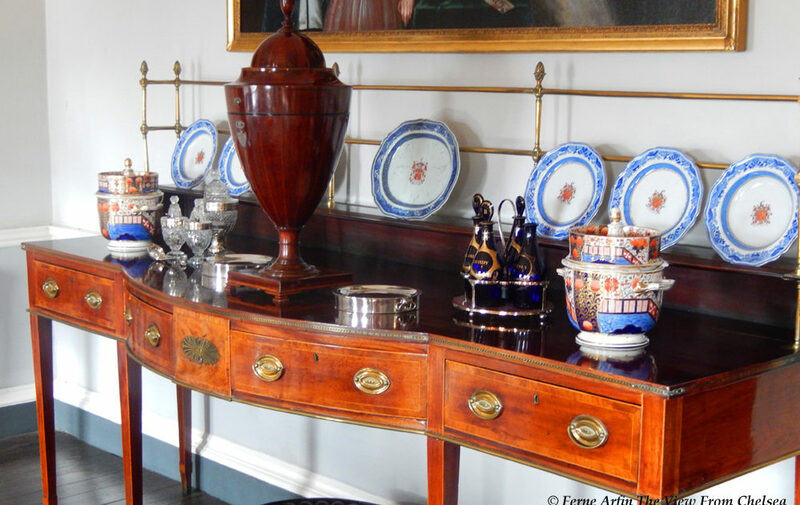 You can expect collections of fine antique furniture, china, silver, porcelain and, depending on the original owner’s wealth, old master paintings or more primitive ancestor portraits. After a while, you know pretty much what to expect, which is not much that you haven’t seen before. What you aren’t often confronted with are the sometimes tawdry stories, the unpleasant side of the 18th century New World fortunes that built these elegant homes. The Georgian House Museum in Bristol is very different. This upstairs/downstairs glimpse into the lives lived in an 18th century Bristol townhouse tells a story that alternates between swashbuckling adventure and grim reality. It’s like wandering into someone’s private home and admiring the fine china before peeking into the closets to rattle all the skeletons. And it’s fascinating. In the 18th century, Bristol was one corner of the triangular trade route over which cloth, guns, manufactured and luxury goods were shipped to Africa to buy slaves for the plantations of the New World. Sugar, rum, tobacco and cotton came back. The sugar plantation slave owners, sugar merchants and shipbuilders of Bristol grew rich from this trade. The house, at 7 Great George Street, now a free museum, is an upstairs/downstairs look at life in a sugar plantation slave owner’s home, circa 1790. As you tour the 11 rooms, arranged on four floors, from kitchens in the basement to elegant upstairs salons. enthusiastic on-site guides bring the history of the house to life. The story begins with family black sheep, Azariah Pinney. Azariah chose the wrong side in a short-lived rebellion against James II . Saved from the gallows – or worse – when his family ransomed his life, he was exiled to the West Indies for ten years. In the early days of the British Empire, impoverished young men of good families could go adventuring after their fortunes in the colonies. Criminals could be transported to them to make a life in far off corners of the world or die trying. The fate of the first Azariah Pinney was a little of both. After his disgrace, he fetched up on the Caribbean island of Nevis, eventually becoming a wealthy sugar planter and slave owner there. Several generations later, a younger cousin inherited the family plantations, wealth and name. By the time John Pinney retired to Bristol from his Nevis plantations, in 1783, he had massively increased the family’s wealth. In Bristol he became a sugar merchant, founding a company that made him many times wealthier than he was in Nevis. Bristol. 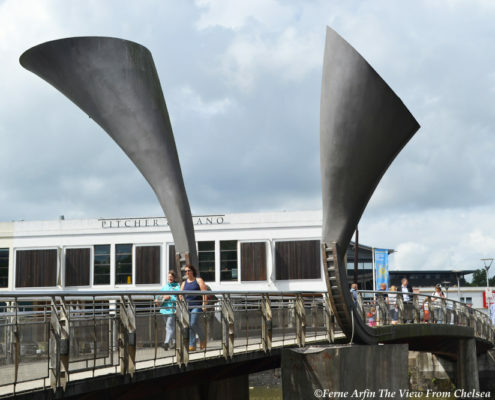 It’s, perhaps, poetic justice, that John Pinney’s name is largely forgotten, but one of Bristol’s most striking modern landmarks is the sculptural Pero’s Bridge, named for John Pinney’s slave. The bridge links Queen’s Square and Millennium Square across Bristol Harbour. Pero’s Bridge named after John Pinney’s personal slave. A small but thoughtful exhibition about the Pinney’s involvement in the sugar trade, the treatment of plantation slaves and the life of Pero adds an important layer of context to this house. In the Georgian period, roughly corresponding to the Colonial and Federal periods in American history, many of the wealthiest families on both sides of the Atlantic were supported by the slave trade and took it for granted. Upstairs rooms in the house give clues to the life led by the family. There is a breakfast room and an “eating room” for more formal dining. Downstairs there’s a beautifully equipped 18th century kitchen, laundry room, housekeeper’s room and large china cupboard. In the housekeeper’s pantry, alongside some of the valuable copper pans, a cone of sugar would normally have been kept under lock and key. One of the downstairs surprises is the plunge pool used by the master of the house. In an age when few people bathed regularly, John Pinney enjoyed a daily, cold water bath and had apparently become accustomed to the practice while a young apprentice in the family business. The nearby city of Bath is known for its avenues and terraces of Georgian houses. But Bristol probably has just as many, if not more. They tend to be a bit less monumental only because Bristol, an important port and aircraft manufacturing city before WWII, lost so many of its buildings in the Bristol Blitz, when the city was heavily bombed by the Luftwaffe. The Georgian House may be less famous than 1 Royal Crescent in Bath but it is probably the most complete 18th century townhouse in the UK. It’s definitely worth a visit to this quiet corner of Bristol, Great George Street, off Park Street, to see it. Opening Hours:The house is open year round though not every day of the week in winter. Because of seasonal variations it’s best to check the website for opening hours and days. Slavery is a thing of repugnance and shame. We should all be ashamed of our forefathers and mothers, who allowed such maltreatment of fellow humans. Agreed, Barry Stephen. But I do think it’s admirable of Bristol to include the real story of how one family’s fortune was made, warts and all, so that visiting this museum is a sobering experience. Sounds like it’s very well done. If I’m ever in Bristol I’ll put it on my list. Yes, really worth your time – especially on a rainy day. This would be so interesting – I will have to visit on my next trip down that way! I like historical houses. Of course the history of slavery is just such as heavy topic. Will put this on my list of places to check out if I am in that area. I love Bath, so, chances are will be there someday again! LOVE your writing … such a pleasure to read! Thought I knew Bristol fairly well, but now have a museum to visit upon our next UK adventure. It appears Bristol, like other cities in the world, such as Berlin, are embracing all the good and not so good of the past to help educate and hopefully guide future generations. Thank you so much Michael. I hope you find the Georgian House Museum and its volunteer guides as interesting as I did. That is kind of museum I would like to see. The one that tells the real story, not only showing some uber expensive stuff from the past. Ah so much history to this. Love it, since I’m a self-confessed history lover!